The 2004 version of the yellow jersey. Since the first Tour de France in 1903, there have been 2,142 stages, up to and including the 2018 Tour de France. Since 1919, the race leader following each stage has been awarded the yellow jersey (French: Maillot jaune). Although the leader of the classification after a stage gets a yellow jersey, he is not considered the winner of the yellow jersey, only the wearer. Only after the final stage, the wearer of the yellow jersey is considered the winner of the yellow jersey, and thereby the winner of the Tour de France. In this article first-place-classifications before 1919 are also counted as if a yellow jersey was awarded. There have been more yellow jerseys given than there were stages: In 1914, 1929, and 1931, there were multiple cyclists with the same leading time, and the 1988 Tour de France had a "prelude", an extra stage for a select group of cyclists. As of 2018 a total of 2,145 yellow jerseys have been awarded in the Tour de France to 286 different riders. In previous tours, sometimes a stage was broken in two (or three). On such occasions, only the cyclist leading at the end of the day is counted. The "Jerseys" column lists the number of days that the cyclist wore the yellow jersey; the "Tour wins" column gives the number of times the cyclist won the general classification. The next four columns indicate the number of times the rider won the points classification, the King of the Mountains classification, and the young rider competition, and the years in which the yellow jersey was worn, with bold years indicating an overall Tour win. 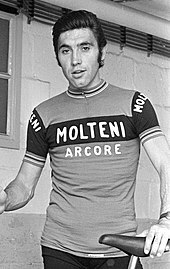 For example: Eddy Merckx has spent 96 days in the yellow jersey, won the general classification five times, won the points classification three times, won the mountains classification two times, and never won the young rider classification. He wore the yellow jersey in the Tours of 1969, 1970, 1971, 1972, 1974 (which he all won) and 1975 (which he did not win). Three cyclists (Jean Robic in 1947, Charly Gaul in 1958 and Jan Janssen in 1968) have won the Tour de France with only two yellow jerseys in their career. Fabian Cancellara is, as of 2016 with twenty nine days in yellow, the rider with the most yellow jerseys ever for someone who has not won the Tour. The two active Tour de France winners Chris Froome and Vincenzo Nibali rank, as of 2017, 4th and 21st, with fifty-nine and nineteen days in yellow respectively. Alberto Contador was stripped of the yellow jersey and 6 days of wearing it in 2010 Tour de France because he tested positive for doping. Until the results of Lance Armstrong were annulled for cheating late 2012, he was ranked second in this list, leading the Tour for 83 stages from 1999 to 2005. The largest number of different riders wearing the yellow jersey in any year is 8. The smallest is 1. ^ a b c In 1929, Nicolas Frantz (LUX), André Leducq (FRA) and Victor Fontan (FRA) were all three declared leader after the 7th stage. ^ a b In 1914, Philippe Thys and Jean Rossius were both declared leader for 4 days. ^ In 1988, on 19 July, there were two stages. Other than the split stages that the Tour de France saw earlier, these two stages were counted as individual stages, so Pedro Delgado received two yellow jerseys on that day. ^ Before Alberto Contador's 2010 Tour de France victory and days in yellow were officially removed, he wore the yellow jersey for 6 days. After his disqualification, Andy Schleck's total increased with 6 extra days. ^ Before Floyd Landis' 2006 Tour de France victory and days in yellow were officially removed, he wore the yellow jersey for 5 days. After his disqualification, Óscar Pereiro's total increased with 2 extra days. ^ a b In 1931, Charles Pélissier (FRA) and Raffaele Di Paco (ITA) were both declared leader after the 5th stage. ^ Jan Raas won the prologue of the 1978 Tour de France. Because the weather changed dramatically during that prologue, the race was invalidated, and Raas was not awarded a yellow jersey. In cycling statistics lists, including the official database from the Tour de France organisation, the victory is awarded to Jan Raas, so this is also done in the list above. ^ In 1988, the Tour de France started with a prelude, a 1km time trial in which one cyclist from every team could compete. This prelude was won by Guido Bontempi, who wore the yellow jersey on the first real stage of the 1988 Tour. The yellow jersey has been awarded to 23 different countries since 1903. In the table below, "Jerseys" indicates the number of yellow jerseys that were given to cyclists of each country. "Tour wins" stands for the number of tour wins by cyclists of that country, "Points" for the number of times the points classification was won by cyclist of that country, "KoM" for the number of times the mountains classification in the Tour de France was won by a cyclist of that country, and "Young rider" for the number of times the young rider classification was won by a cyclist of that country. The "Most recent" column shows the cyclist of the country that wore the yellow jersey most recently. The "Different holders" column gives the number of different cyclists of the country that wore the yellow jersey. Sixteen riders have quit the Tour while wearing the yellow jersey. Greg LeMond in the final stage of the 1990 Tour de France, wearing the yellow jersey despite not winning any stage in that year. Of these seven cyclists, Walkowiak is the only one never to win a Tour stage at all. Firmin Lambot won stages in the 1913, 1914, 1919, 1920 and 1921 Tours, Gastone Nencini won stages in the 1956, 1957 and 1958 Tours, Aimar won a stage in the 1967 Tour, LeMond won stages in the 1985, 1986 and 1989 Tours,, Pereiro won a stage in the 2005 Tour, and Froome won stages in the 2012, 2013, 2015 and 2016 Tours. Alberto Contador initially also belonged to this group, when he won the 2010 Tour de France; however, he was later stripped of this title. Every Tour de France only has one winner. But a cyclist that has won the Tour de France previously can enter the race again, and a cyclist not winning the race can win the race in a later year. In almost every Tour de France, there were multiple 'former or future' Tour de France-winners in the race. Only seven times, the Tour started without any former Tour de France winner. This happened in 1903, 1927, 1947, 1956, 1966, 1999 and 2006. Only in 1903, apart from the cyclist that won the race, was there no other former or future Tour de France winner. Eleven cyclists won the general classification the first time they entered the competition. Fausto Coppi is the only cyclist who won the Tour de France in both the first and the last Tour he entered. ^ a b "Tour de France 1914" (in German). www.radsport-seite.de. Retrieved 17 March 2008. ^ a b McGann, Bill; McGann, Carol (2006). The Story of the Tour De France. Dog Ear Publishing. p. 92. ISBN 1-59858-180-5. Retrieved 17 March 2008. Frantz, André Leducq and Victor Fontan, who were in that winning stage 17 break, were exactly tied in time. Today the judges would go back to the time trial and look at the fractions-of-a-second differences. If that doesn't resolve the tie, then a look at placings solves the problem. The Tour didn't have rules to take care of ties, so 3 Yellow Jerseys were awarded. ^ a b McGann, Bill; McGann, Carol (2006). The Story of the Tour De France. Dog Ear Publishing. p. 118. ISBN 1-59858-180-5. Retrieved 17 March 2008. Leading up to the Pyrenees, Italy's ace sprinter Rafaelo di Paco dueled with France's Charles Pélissier for stage wins and the lead. After stage 5 they shared the lead for a single day. ^ a b "75ème Tour de France 1988 – Prélude" (in French). www.memoire-du-cyclisme.net. Archived from the original on 26 May 2006. Retrieved 17 March 2008. ^ "Historical Results – Tour de France". Cycling Hall of Fame.com. 2002–2007. Retrieved 17 March 2008. ^ Magowan, Robin (1996). Tour de France: The Historic 1978 Event : Commemorative Edition of 75th Anniversary. VeloPress. ISBN 978-1-884737-13-8. ^ "Riders that abandoned Tour de France in yellow jersey". www.infostradasports.com. 25 July 2007. Retrieved 17 March 2008. ^ "Few have won yellow without a stage win". Cyclingnews. Future Publishing Limited. 22 July 2000. Retrieved 17 March 2008. ^ Tom James (4 April 2001). "Thys in spite of Pélissier". Retrieved 17 March 2008. This page was last edited on 6 April 2019, at 02:56 (UTC).